Happy Chanukah to our Jewish friends, coworkers and customers! For those who aren’t aware of the origins of the holiday, Chanukah is the celebration of the re-dedication of the holy temple in Jerusalem after the Jewish victory over the Syrian-Greeks in 165 B.C.E. It is celebrated for eight nights because, according to the story, the Jewish soldiers had enough oil for one day, and it miraculously lasted for eight. Like many other Jewish holidays (Passover, for example), Chanukah has accompanying food traditions. Fried and dairy foods are especially popular at this time of year. Since Chanukah celebrates the miracle of the oil that burned for eight days instead of just one, foods that are cooked in oil are especially popular for this holiday. One such food is potato pancakes, or “latkes”. 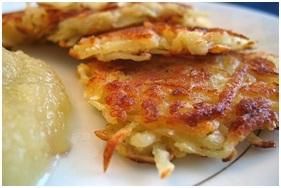 These are made with potatoes, onion and either matzah (unleavened bread) or breadcrumbs. Many people eat this dish with applesauce of sour cream on top. 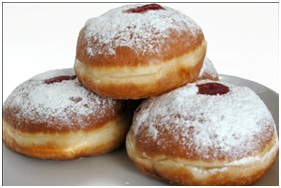 Another fried Chanukah dish is called “Sufganiyot”, or jelly-filled doughnuts. Recently though, since more and more people are becoming health-conscious, this dish has been placed on the back burner in many Jewish homes. Dairy is served on Chanukah to remember Judith, a Jewish woman who, according to legend, saved her people from the Babylonians by serving their leader salty cheese to make him thirsty, followed by large amounts of wine. When the leader fell “asleep”, Judith killed him, and the Babylonians left her village. 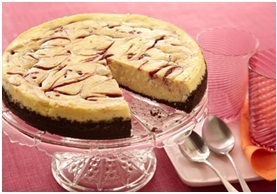 In order to honor Judith for her bravery, we serve dairy for this holiday, such as cheesecake and blintzes. 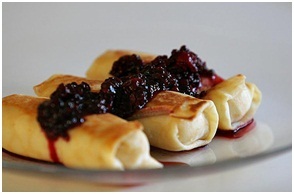 Blintzes are thin pancakes (like crepes) which are stuffed with a cheese filling and then fried in oil. If you’ve got a favorite Chanukah recipe that you’d like to share, leave a comment below, we’d love to hear it! And again, Happy Chanukah from ChefUniforms.com!